Velma Stapleton interviewed March 2012. Velma Stapleton loved country music. In fact, her dream had always been to be a country performer, and record an album. She would eventually record an album – but it wasn’t country. 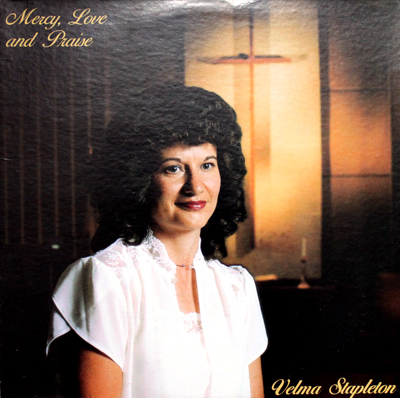 Velma’s move from secular to spiritual music wasn’t an overnight switch. She had already been singing Christian songs at an early age, growing up in Lamar (she graduated Lamar High School in 1971). When she married, her family, which included her boys Michael and Steven, would take to the road to perform in Ohio, West Virginia, and Kentucky. In 1983, at the urging of her pastor, she recorded her one and only album. Standard issue gospel here, but Velma gets to use her country chops on at least one song, "It Made News in Heaven." The picture on the front cover of what was to be titled Mercy, Love and Praise, was taken at her church. "The picture on the back was done in a studio,” she said.